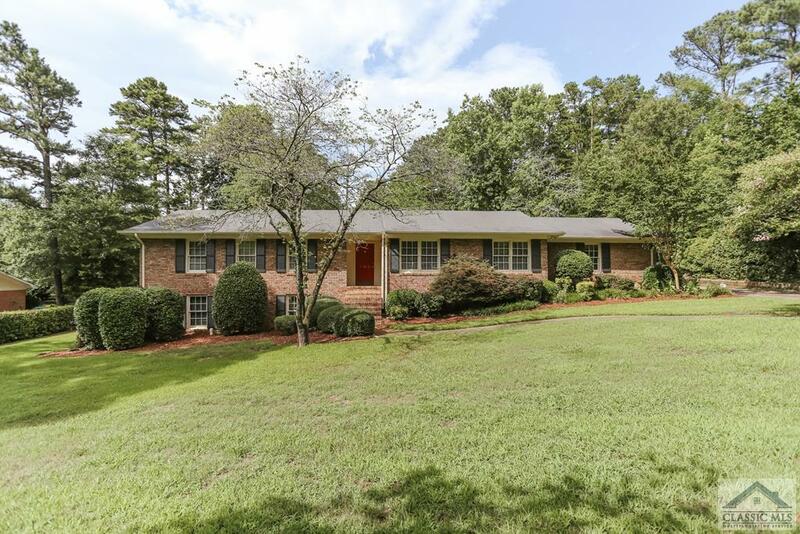 Discover the boundless potential of this 1970's brick charmer in Holly Hills. This 3BR/2BA ranch-style home features over 1,600 sq. ft. of main level living space, a large unfinished basement with interior and exterior access, a two-car carport, and a magnificent landscape of mature trees and plantings on this .96 acre lot. This home has been lovingly maintained and offers excellent renovation potential. Just through the front door is a formal entryway which opens to three separate areas of the home. To the right of the entryway is a large formal living room and formal dining area which extend along the front side of the home and enjoy abundant natural light throughout the day. Accessible from the dining area is the kitchen, laundry closet and breakfast area. There is also access to the two-car carport with separate storage/utility room. The kitchen area leads to a second living space with a brick fireplace and built-ins. Also in the great room is an open staircase to the large unfinished basement and access to the large and private back deck. Enjoy sweeping views of this expansive and incredibly well-maintained landscape not often found at this price point. To the left side of the home is a central hallway. To the left of the hallway are two spacious bedrooms with a shared bath. To the right of the hallway is a master bedroom with attached master bathroom. This bathroom is also accessible to the hallway and features a separate room with shower and a second vanity. Zoned for Timothy Elementary. Convenient to both Epps Bridge and Atlanta Highway retail developments. Easy access to Loop 10 and Highway 316. Holly Hills is a subdivision within the city of Athens, Georgia. There are currently 0 Homes for Sale within Holly Hills, with asking prices ranging from $0 to $0. The average list price per square foot of the available inventory in Holly Hills is $0, which is the Athens average of $213. The Average Sales price of all sold real estate in this subdivision for the past year is $174,364. Recent comparable homes have been selling for 95.89% of their asking price. Waterfront homes represent of the available Holly Hills inventory. The population of Athens, according to the 2010 Census, is 115,452. The total number of households in the zip code of Holly Hills is 16,955, with an average household size for of 2.33 people. The total number of renter households within the zip code of 30606 is 9,063, which means that 46.55% of households in this zipcode are owner occupant households. 160 Winterberry Drive, Athens GA 30606 is a Home, with 3 bedrooms which is recently sold, it has 1,623 sqft, .51-1 sized lot, and Carport parking. A comparable Other, has bedrooms and 0 baths, it was built in and is located at and for sale by its owner at $ 0. This home is located in the city of , in zip code , this County Other, it is in the Subdivision, and Bedgood Glenwood are nearby neighborhoods.